Rest? Who needs rest? (Or a honeymoon, for that matter!) Only three days after exchanging vows during a beautiful ceremony at St. George’s Chapel in Windsor, newlyweds Prince Harry and Meghan Markle attended their first event as a married couple. The newly-minted Duke and Duchess of Sussex joined the birthday festivities for Prince Charles at Buckingham Palace on May 22. Although the heir to the throne doesn’t turn 70 until Nov. 14, the Royal Family opted for a May celebration — a more fitting date to throw a garden party, and an ideal way to avoid the miserable late-autumn weather. The event is a celebration of Charles’ lifelong charitable works and his associations with military regiments and units. 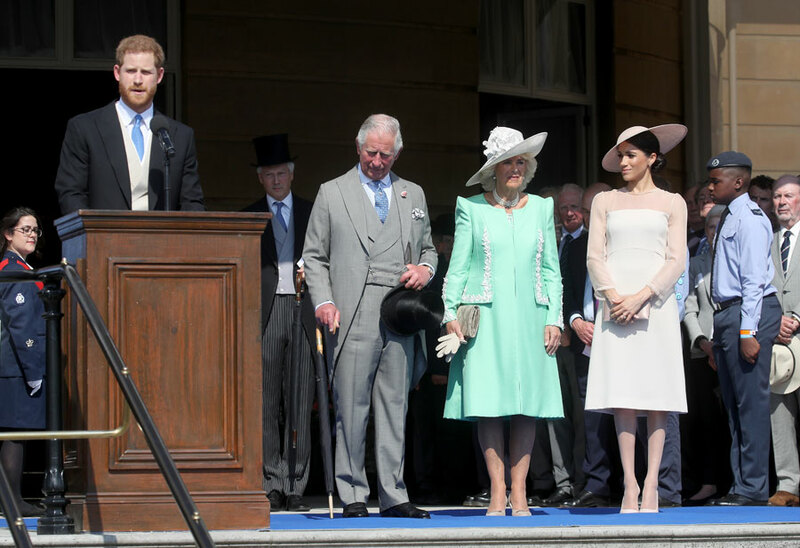 The Duke of Sussex pays tribute to his father, Prince Charles, while the Duchesses of Cornwall and Sussex look on. Photo: Chris Jackson/Getty Images. Speaking to guests, Harry paid tribute to his father while recognizing the victims of the Manchester Arena bombing a year ago. “We’re here today to reflect on and to celebrate my father’s dedicated support to all of you and the work that you do. But first I would like us to take a moment to reflect on the tragic events at the Manchester Arena a year ago. 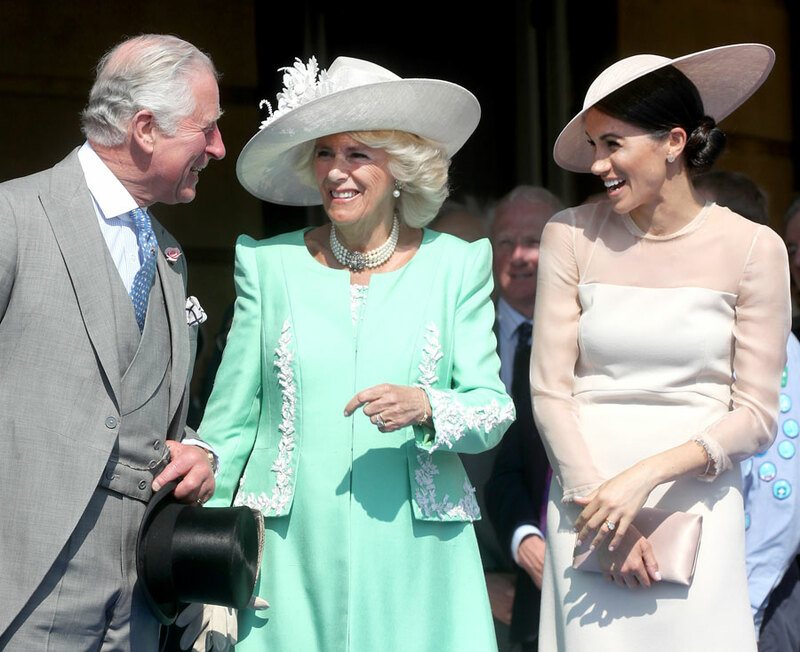 Despite having a whirlwind week so far, Meghan didn’t seem the least bit concerned about delaying her honeymoon, as the Duchess of spotted sharing an inside joke with mother-in-law, Camilla, Duchess of Cornwall. The Duchesses of Cornwall and Sussex share a laugh. Photo: Chris Jackson/Getty Images. 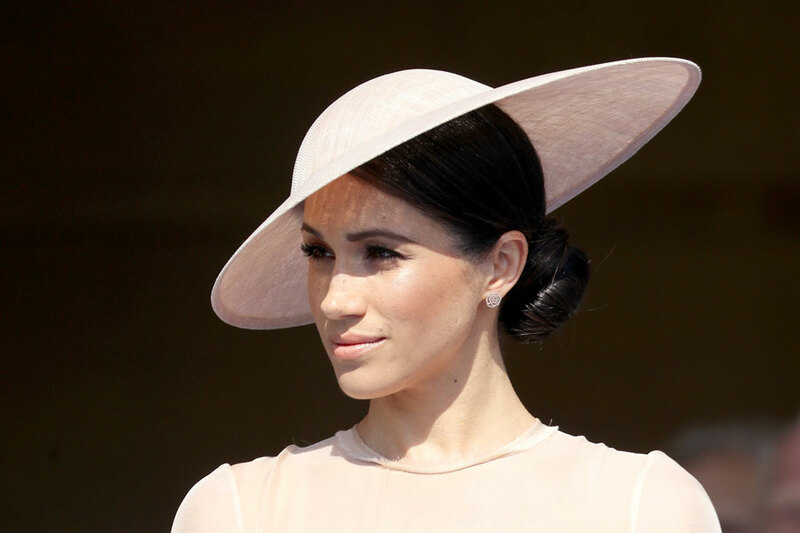 Meghan looked positively regal (not to mention, incredibly British) in a peach Goat dress, Vantugen earrings and a bespoke hat by Philip Treacy. The Duchess seemed at complete ease with her new in-laws. On Saturday, Prince Charles had the honour of walking Meghan partway down the aisle on her wedding day after her father, Thomas Markle, was too ill to attend. The Duchess of Sussex shared a laugh with her new in-laws. Photo: Chris Jackson/Getty Images. In a statement released by Kensington Palace this weekend, the Prince said he was “pleased to be able to welcome Ms. Markle to The Royal Family in this way.” He also accompanied her mother, Doria Ragland, after the ceremony.